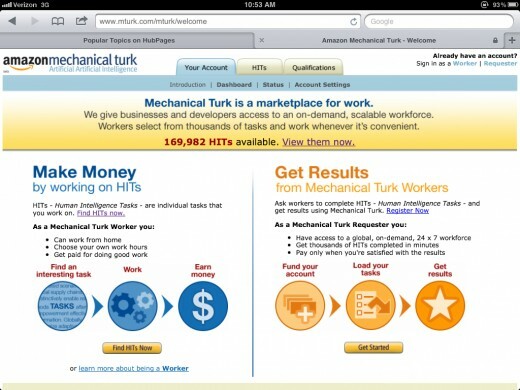 What Is Amazon's Mechanical Turk? Amazon Mechanical Turk (MTurk) is a "crowdsourcing Internet marketplace." This means requesters can make "human intelligence tasks," abbreviated HITs, available to Mechanical Turk users. Crowdsourcing marketplaces are very popular. They allow employers to hire workers at will, instead of paying them a salary or wage, to accomplish tasks computers cannot do well. For example, a HIT may consist of choosing which picture is better, writing a product description, or transcribing an interview. Marketing and behavior studies are also popular HIT topics. Can I Actually Make Money on Mechanical Turk? In a word, yes. You absolutely can make money on MTurk, but it takes time and effort to produce real results. I have read many articles online claiming that MTurk is a huge waste of time and you can never make money - these people did not take the time to learn the system. 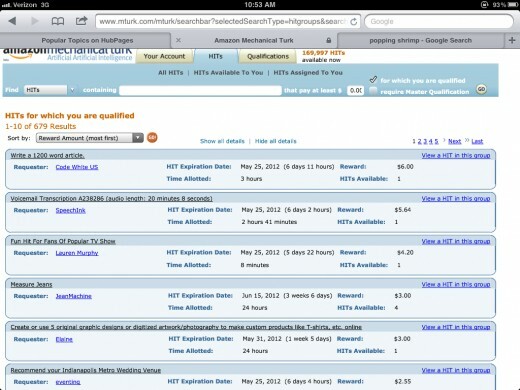 As you can see by looking at the screen capture below, I was ultimatly very successful on MTurk. I did not write for MTurk requesters frequently during 2012 because I didn't have the time, but the 2011 earnings shown reveal the amount I made from August through Decmeber of that year. $3,800 in under half a year is a pretty nice income booster! However, I struggled through my first several weeks because I did not have a solid plan. I accepted random HITs, accidentally abandon a few, and even got banned by a requester. Avoid these mistakes and discover how to make money by reading my hard-won knowledge below. Before accepting any HITs, you must create a free account. You can use the same email address as your regular Amazon account, but you do have to set up a separate MTurk account. The process is quick, painless, and secure. When you first access the MTurk website, you should see the same image given in the screen capture below. If your screen looks different, you may have found some sort of knock-off website. Check the web address for typos and try again. In order to get well-paying HITs, you must earn a high approval rating. Many HITs require you to have successfully completed a specific number of prior HITs, usually 100 or more. In order to gain access to the better tasks, devote some time to finishing simple, easy tasks, even if they only pay a penny or two. By earning a high approval rating, you increase your chances of getting better HITs. In order to find HITs you are qualified for right off the bat, go to the main HIT page and click the "for which you are qualified" box in the upper right portion of the page. If you look at the screen capture below, you can see this box is checked. You can also sort the HITs in a variety of ways. The default is to sort by the number of HITs available for a certain task. Usually, but not always, the HITs with a higher number of available tasks pay the least. This means these tasks are a great way to start out and boost your numbers. However, if you want to see better-paying HITs you are qualified for, make sure the aforementioned box is checked and sort by "Reward Amount (most first)," as shown in the picture. When you are just starting out, you can frequently take advantage of university and marketing surveys. These surveys usually take 10-30 minutes to complete and pay a dollar or less, but they are a good way to make a few dollars without taking special qualification tests. Once you have 100 or more approvals on your account, look for better-paying HITS. 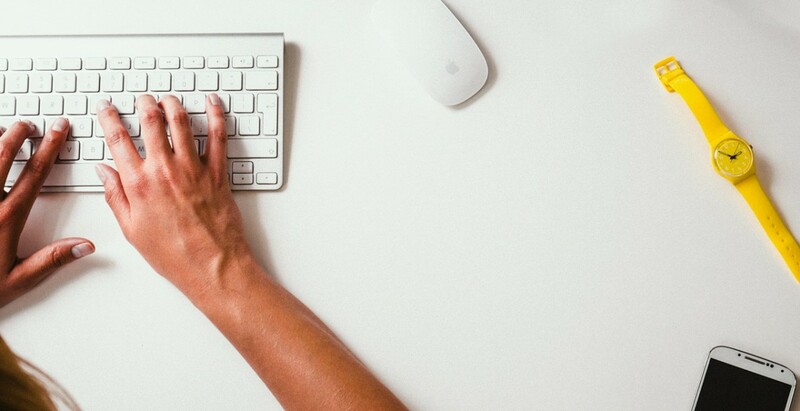 If you are an accurate typist, take a qualification test for one of the transcription services. Transcription HITs, particularly longer ones, usually pay fairly well. If you are a strong writer, look for writing HITs from companies like QuestionSwammi and CrowdSource. Many companies that require qualification tests have multiple levels of qualification. By taking the entry-level test and satisfactorily completing HITs for the requester, you can frequently take higher qualification tests and earn access to even better paying HITs. I have actually seen writing HITs for a specific MTurk worker that paid $50, or even more! For me, writing is the main way I earn money on MTurk. I primarily write for CrowdSource. Its HITs vary, but it is common to see a 100 word product description that pays $2.25 and requires a basic certification. With a better certification, you can make $5-$10 per HIT. If you write well and quickly, you can easily write 100 words with a main keyword and a secondary keyword in just a couple of minutes. My highest-earning day from writing brought in over $100, and I 'worked' less time than I do at my real job! My number one piece of advice for becoming successful on MTurk is always pay careful attention to a HIT's requirements. If the task says to use a specific keyword three times, use it three times. If they say to avoid using all "be verbs." do not use a single be verb. If you ever accept a task and find it is not what you expected, hit the "return" button. Simply abandoning a task hurts your account's stats, and submitting a HIT that is sure to get rejected hurts your approval rating, which affects the HITs you can accept in the future. How do I Get Paid by MTurk? You can receive your payments from MTurk in one of two ways - direct deposit to your bank account or as an Amazon gift card. You may only request a payout if your account has 1) been open for at least 10 days and 2) has at least $10. Ten dollars is one of the lowest payout thresholds available on the web. You may request a payout at any time, as long as these conditions are met. Many other Internet services make you wait for a specific day and require a much larger deposit. For example, crowdsourcing site iWriter pays on Tuesdays and requires a minimum balance of $20. You may also apply the balance of your payments account (money you have earned but have not transferred to your bank account) to an Amazon purchase at any time, no matter how much or little is in the account. I am always impressed by the speed with which Amazon credits my bank account. The payment page says to allow up to a week, but I usually see the money hit my account the next day. If you follow these steps, you can become successful on MTurk. If you are willing to put in a lot of work to earn the credentials needed for well-paying HITs, you could earn a decent income from home. The money I made on MTurk was earned during my free time and days off from my full-time job. In summary, carefully build your on-site credentials, take qualification tests, and keep your approval rating high to see the money start coming in. Earn Extra Money Taking Surveys at Home-- Yes, It Really Does Work! At the time I earned it, dear guest, it was not unheard of. I worked hard to get qualifications for high-paying writing and editing hubs and paid attention to what time of day new HITs were released. Many HITs today do not pay as much, but high-paying ones are out there. 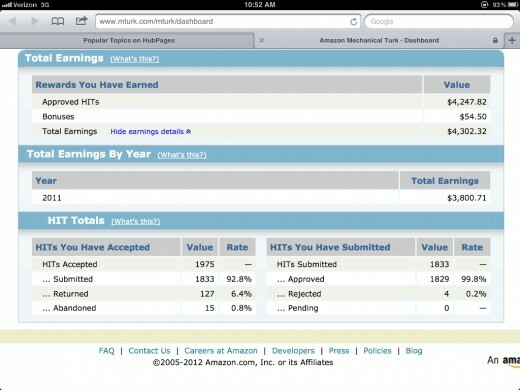 The screen shot in this hub is accurate - I have better things to do with my time than fake mturk earnings shots! I'm sorry if you haven't found the same success. I've been on MTurk for about a month now and I've made about $60 so far. I really have not spent a lot of time on it. Thanks for writing this HUB. Thumbs up and useful. Great Information. I never heard about this one before, so thanks for sharing.. I'm not sure. Individual requesters have specific patterns and times when they did to release HITs. My favorite requesters usually sent out new HITs in my late morning, but other companies put out things on other schedules. Just pay attention to when the HITs you want come available! What is the best time to work on Mturk in your opinion? Just like I said above - MTurk is not currently accepting Indian workers to keep the English standard high. i'm an indian and how do i create my new mturk account.. Unfortunately, I've read on the MTurk forums that many Indian requesters are not accepted because so many end up being rejected. Most of the requesters who want written information are looking for American English and are very strict about what they accept. It's really easy - just go to the mturk front page, go to the 'worker' section, and create a new account. On the first screen capture you can see the left side of the page has things written in blue. That is the worker side of the page. Just click on the yellow 'get started' or on the blue 'learn more about being a worker' located just below the yellow button. I dn't know that how to create a Mturk Account. I'm honestly not sure. It probably asked me when I signed up, but I don't remember! I'm really sorry - if you find out, will you please let me know? Fascinating! Do you have to be a certain age to participate? For instance, can a high schooler use this for a little extra income? Going to check this out. This is truly new information to me Natashalh. I thank you very much for writing about this and sharing your tips. Voted up and SHARED! Thanks for stopping by, donnah75! This sounds like it is worth looking into. Thanks! Sure thing! I hope you give it a try to it works well for you. Thanks for the votes and sharing! Wow, this is the first I've heard of MTurk! You've been quite successful with it and I really appreciate the hints and advice you give. I'll definitely look into it. Thanks! Voted up and shared. I never did anything that required downloaded content. In fact, you should check the ToS to see I'd that's allowed. Even the transcriptions I did allowed the audio files to play in-browser. Thanks for sharing, MargaritaEden! I'm glad you found it useful. Very good article. Actually I started on Mturk just a few days back. A question, can one be absolutely safe in going to the needed sites and downloading the content they ask. Thank you. Thank you so much for this wonderful article, very interesting and practical, I am researching more about it and your hub was very useful! Sharing it. Nice! I'm glad you're finding success. That's awesome. You should be ready for your first payout as soon as your account is old enough to allow it. Thanks for stopping by and taking the time to comment to let me know how this is working out for you. I have been doing it for 4 days now and I have earned $9.46. I have more request pending. I recently on my lunch break at work did a secret shopper assignment by calling a company and asking questions about the home monitoring services they offer. It was a quick $2.00 for the minimum of two minutes that I had to stay on the line. They wanted to know if the associate was rude and if I would really buy the product. I like it so far. I really love your tips. I didn't know that I could return a Hit that helps a lot as well as the tips of doing some of the penny ones to build my creditability. Now I know what I need to do. Thanks so much! Thank you, alcosin. I hope you find th suggestions useful if you give it another try! That is impressive. I did sign up before but wasn't making anything so didn't pull through with it. Your earnings are impressive, though, so I'll take a look at it again. Voting this Up and Useful. Kumaran - it is totally free to sign up for Mturk. (HubPages, too, if that is what you meant!) I avoid anything that claims you will make money but requires you to pay to participate. Bhavin Panara - Thank you! I am honored. First time ever i have read the complete hub by any writer. Excellent! I glad you found it useful. Thanks for stopping by! Thank you for the very useful information, Natasha. I've never heard of Mechanical Turk, but I'm definitely going to check this site out! It sounds interesting. There are definitely ways to not make much on MTurk, that's for sure! I personally never found transcribing on there very profitable, but I'm also not fantastic at transcription. Glad you found your own way to make money online! Thanks for stopping by. That's great ! I've worked on mturk during my earlier days trying to make money online and I made around 100$ in 3 months I guess. I mainly used to do transcription services. Personally, I felt I was underpaid ,so I quit to become a freelance transcriptionist. Anyway, its important to figure out how the site works inorder to optimise the earnings ! Great hubs ! It was really nice to get online this morning and see three new comments! Thanks, Vinsya, jellygator, and teaches! 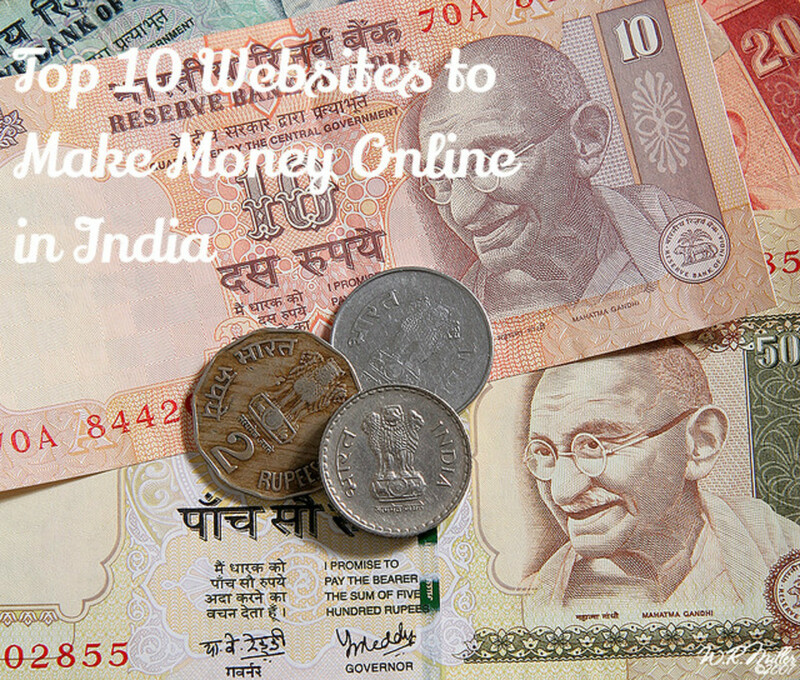 Quite honestly, I found out about the site by doing an Internet search on ways to make money online. Even though I have sold things on Amazon Marketplsce for a while, I hadn't heard of MTurk. I basically kept at it because I was having some financially difficult times and was determined to make some money, even if I had to spend all of my free time on the site. I was very, very excited when my work really started paying off! Last fall, I viewed it as some type of game - I would see if I could beat my previous high-earning day and make even more. I have not heard of this site. It is one that I am going to look into this week. Have to say that from what I read and the comments, it takes some dedicated effort to make it through the first months. However, the ability to pull some income at a faster pace is encouraging. Thanks for sharing. I've never heard of it either, but I'll definitely check it out. Never heard of Mechanical Turk. Wow, you have done great job there. Thanks for sharing your success story. Thank you, Marla Srivastava, for stopping by and commenting! Thanks for sharing such useful information about this money making site. I might try it in future. wetnosedogs - You're right, MTurk does take some working. I was so thrilled the first time I could make a $10 deposit! It took a while to really get going. Brainy Bunny - That's pretty much what I do/did with my MTurk money - used it to buy things that weren't really in my budget. My favorite expensive thing to buy on Amazon is actually really high-quality dog food. Go figure! I actually discovered HubPages because I started thinking about where the pieces I wrote for someone else were going. I realized if they were willing to pay me five bucks for 250 words, they must be planning to make more from my work or it wouldn't be profitable and they wouldn't do it. I have yet to make five whole dollars from a single piece of writing on HP, but I can write about what I like and have confidence things will work out in the long run. Sometimes I feel a little silly spending a lot of time on here, though, because I know I could make more money more quickly on MTurk. Ah, well. I have used MTurk in the past, and while I have not achieved anywhere near your level of success, it is because that wasn't my goal. I use it mostly around holiday times, when I could use a few extra bucks to buy gifts on Amazon without upsetting my budget. I am very impressed by what you've done, because I wasn't aware that you really could make quite that much. I think I'll take a closer look the next time my business has a slow period! I have tried Mturk here and there, but it seems I really just have to stick with it. Thanks for great information and congratulations on a good sum of money for your work. You're right, billybuc, it is kind of out of the ordinary for me! I had two main reasons for writing it. People I know from work, school, recreational activities, etc. are always asking me about writing online because they know I do. I decided if I was going to write this all down frequently for people, I might as well turn it in to a hub! Second, I have seen a lot of pages online claiming that you just simply cannot make money on MTurk, which is patently false. Yes, it requires time and effort. It builds slowly and it isn't for everyone. However, if you are willing to put in some time and wait it out for a month or two, you can start to get the better HITs and make some real cash. Well my dear, that was a change of pace for you! I have never heard of this site but I will for sure check it out this weekend. Thank you for the heads up; since I respect you I will take this info and give it the diligence it deserves. Yes, UnnamedHarald, there are some bad requesters! And there are some HITs that are clearly scams. Luckily, you can return HITs and then flag them for breaking the rules. It isn't perfect, but even if you only make $10 a day doing a few surveys, if you do that every day the money really adds up. Thank to both UnnamedHarald and twinstimes2 for stopping by! This is my first hub with the 'new' technology layout and it was kind of difficult for me spot the comments at first. Thanks for the tip, Natashalh! I will need to check out MTurk! That's quite an achievement. I spent 2 or 3 months there and made about $150, so it's not a scam. I was doing pretty good and then the content requestor I worked with changed their rules and wanted stuff with so many keywords specified "just so" it was impossible to to write a coherent article so I just walked away. You do have to be careful about requestors-- some have bad reputations-- but the community is pretty good about warning people off. Nice article.